Located just minutes from the Tampa - St. Petersburg - Clearwater area of Florida’s Gulf Coast is the Commodore Beach Club, a classic, beach resort with non-stop views of the Gulf of Mexico. Located in beautiful Madeira Beach, this Florida timeshare resort is your perfect spot for enjoying leisurely walks on the wide open beach or unwinding by the heated pool. And when you want to amp it up a little, there’s so much to do nearby. Plan a day for parasailing, rent a fishing boat, shop at malls, boutiques, or outlet stores, take in the thrill rides and adventure of Busch Gardens, or the gaming and entertainment of the Hard Rock Hotel and Casino. 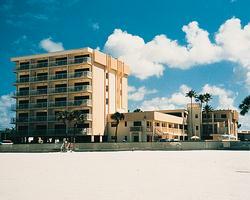 When you are shopping for a Florida beachside timeshare resale or rental, you already have an ideal property in mind. Many vacationing families and couples prefer a beach timeshare that affords them unpretentious décor and a flip-flop friendly ambiance. If your idea of a great seaside vacation is casual, relaxed, and friendly, then you’ve come to the right place. 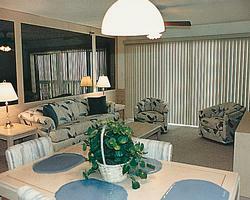 This Suncoast vacation condo resort property offers six different floor plans and approximately thirty units. All units have a full kitchen, exclusive of some studio plans which offer a partial kitchen. One-bedroom plans, with a sleeper sofa in the living area, are available with either a beach view or a pool view. Two-bedroom plans are available in three different layouts, all with spacious living and dining area, some two-bedroom plans include two private bathrooms. Studio units sleep up to two vacationers, one-bedroom units accommodate up to four, and two bedroom units sleep up to six. Many units have a private balcony with patio chairs, providing a perfect spot to grab a nap or savor an evening sunset over the ocean. Commodore Beach Club vacation owners enjoy relaxing by the sparkling swimming pool or a leisurely soak in the Jacuzzi/hot tub. Nearby the resort are cafes and restaurants, salons, a fitness center, and an arcade and game room. Convenient free parking is available onsite, and the resort offers a multilingual staff and concierge desk services. Contact Commodore Beach Club Specialist Today!